“The Jews from Macedonia and the Holocaust: History, Theory, Culture” (bilingually published in Macedonian and English, Skopje: EuroBalkan Press, 2011) presents an academic replica of the great subject of the Holocaust in Europe, although its perspective is determined by confining its narrow field to the study of the Holocaust over the Jews in Macedonia. Therefore, the central subject of scientific interest is the tragic destiny of 7,148 Jews from Macedonia killed in 1943 in the gas chambers of Treblinka II (Poland), their culture and ontology, but also the complex discourse of the post-Holocaust theoretic thought. The frame of such theoretic focalization constitutes the fundamental characteristic and distinction of this book. The chrestomathy “The Jews from Macedonia and the Holocaust: History, Theory, Culture” introduces a polemic on the code of the Jewish narrative and its rhetoric, focalized at the Jews from Macedonia, them being the selected target group of the Nazi final solution in Europe during the Holocaust. 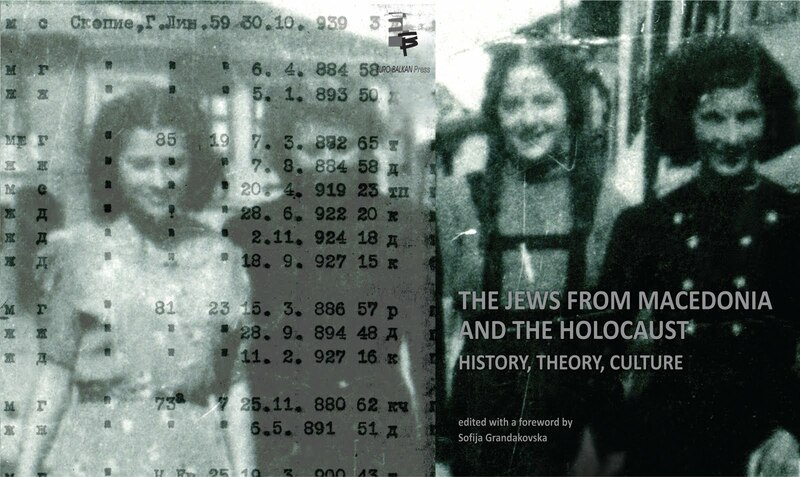 With the prism of interdisciplinary and intertextual approach, and within the broader understanding of the term holocaust, the excerption of the Jewish question and its “special treatment” within the Nazi plan and the Second World War, provided our subject of discussion, through its central axis-the Holocaust, to penetrate, most expectedly, into two other broader frames with chronological portent: pre-Holocaust and post-Holocaust theoretic thought. The chrestomathy in its general structure is a triptych covering three major aspect of discussion regarding the present subject on the Holocaust: history, culture and theory and is structured by 14 original texts from: Vera Veskovic-Vangeli, Marija Pandevska, Liljana Panovska, Jasminka Namicheva, Jamila Kolonomos, Ivan Mikulcic, Krinka Vidakovic-Petrov, Samuel Sadikario, Ivana Vucina Simovic / Jelena Filipovic, Jovan Culibrk, Tijana Milosavljevic Cajetinac, Sofija Grandakovska and Gil Anidjar. However, in its narrower structure it encompasses a sub-triptych that forms the composition: 1. Discursive discussion, proposed by the fourteen original works, created by the authors in accordance with the purpose of this publication; 2. Historical-documentary level, which refers to the presence of archival material that is of closer crucial importance for the Holocaust in Macedonia as a result of the research process and 3. Visual level, semiotically determined as an exhibition in the publication or iconic discussion on the photographic material present here, which brings closer the narration of the research process and the chrestomathy. The synthesis or unity of the sub-tryptich is multiplied on a third level- in the exhibition within the project, a visual replica of the iconic and discursive level. The “triptych into triptych” gives form to the diachronic structure of the chrestomathy in combination with the unattainable domain of the profoundness of evil and the range while presenting its details. Sofija Grandakovska, academic, theorist and poet, engages in interdisciplinary studies in comparative literature, Byzantine and cultural studies and visual semiotics. She holds a BA, MA and PhD from the Department of Comparative Literature at the Faculty of Philology “Blaze Koneski”, SS Cyril and Methodius University, in Skopje, Macedonia. In 2006 she was recognized as the best Young Scientist of the Year and received the Vita Pop-Jordanova Award from the Macedonian Academy of Sciences and Arts (MASA) in the field of literary studies, awarded in accordance with international classification. She has also received several other accolades in the field of humanistic disciplines and creative activity: an award as a sign of recognition for the affirmation of SS Cyril and Methodius University, Skopje (2006), the National Recognition by the Decision of the Government of the Republic of Macedonia regarding her receiving the Vita Pop-Jordanova Award from MASA (2006), a testimonial for her academic and scientific project “Female Monasticism in Macedonia”, awarded by Ford Grant and the Museum of the City of Skopje (2004) etc. She is a member of the Union of Comparative Literature in Macedonia and of the International Association of Comparative Literature (AILC/ICLA). Sofija is the author of the scholarly books The Discourse of the Prayer [Говорот на молитвата](2008) and The Portrait of the Image [Портретот на сликата](2010), and two books of poetry The Eighth Day [Осмиот ден](2005) and The Burning Sun [Препечено сонце](2009), editor of the bilingual book The Jews from Macedonia and the Holocaust: History, Theory and Culture [Евреите од Македонија и холокаустот: историја, теорија и култура] (2011) (http://www.jewsfrommacedonia.mk/) and is co-editor of the bilingual book-zine edition DOMA [HOME], vol. 1 (2010). Her research papers have been published in many theoretical anthologies in Macedonia and abroad. Currently, Dr. Grandakovska works as assistant professor at the Institute for Social and Humanities Research ”Euro-Balkan”, Skopje, Macedonia, where she teaches Contemporary Theories of Culture.